The House on Haunted Hill type idea of staying in a creepy castle for a bet is a well worn plot device and Castle of Blood adds little originality on this score. However by pumping in the mist, spraying on the dusty cobwebs and illuminating long shadow casting candelabras what the viewer is treated to is a bona fide gothic classic that, brief norkshow aside, could have been made at any time during the prior three decades. The film is both priceless and timeless. Ruggero Deodato is credited as an assistant director to Sergio Corbucci and, Mr jungle miniature himself, Antonio call-me-Dawson Margheriti. 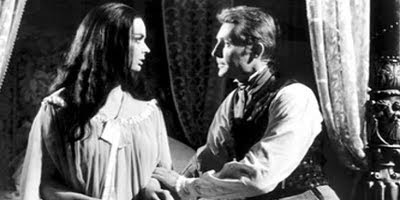 However, the icing on the cake is the exquisite performance from the mesmerizing Barbara Steele who was made for roles such as these. The finale is rather abrupt and is not so much of a twist but shocks nevertheless and it is all nicely rounded of with some Bava-esque black humour. Edgar Allen Poe is introduced as a character but this really adds nothing in particular to proceedings. It is merely needless Poe-sploitation and the film is much better than that.